Since 2007 the FAI have been visiting various Counties around the Country as part of the week long ‘Festival of Football roadshow’. It is a fantastic way to connect with Clubs who are making a difference in the development of the game in their particular area. This be the first time the Festival will be brought to Meath having visited, Kerry, Mayo, Monaghan, Wexford, Clare, Donegal, Wicklow, Westmeath, Sligo/Leitrim, Tipperary, Kilkenny and Cork in recent years. This years Festival of Football will take place between Sunday 21st July 2019 to Saturday 27th July 2019. 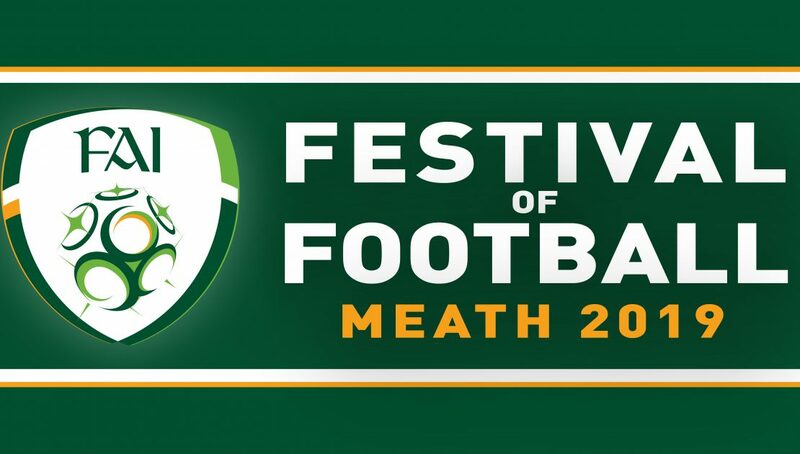 Among the events planned for the weeklong Festival are numerous daily visits to Meath Clubs by former and current Republic of Ireland Internationals, well known football personalities, high profile coaches, and FAI personnel as they take part in soccer camps and games across the County. The FAI Coached Department will run a festival in tandum for the weeklong celebrations and offer a unique opportunity for parents and aspiring coaches to complete introductory level courses and workshops, while football fun days will take place at Clubs around the County. The FAI will make equipment, funds, match tickets and services available to Clubs in Meath to mark the hosting of the Festival which will culminate with the FAI Delegates Dinner and AGM. The dinner and AGM will be attended by approximately 300 Leagues Delegates and Provincial Representatives from every corner of the Country as they descend to this beautiful and vibrant Soccer County. At the Delegates dinner numerous awards will be presented to acknowledge people involved in the development and administration at the grassroots level of the game nationally.